This handy device lets you raise your loco just above the rails to either test it or run as a display. 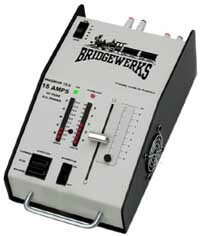 This remote unit plugs into any Bridgewerks unit , letting you remotely control the speed of your locomotives. Operates up to 100 feet away. The ultimate train power supply! 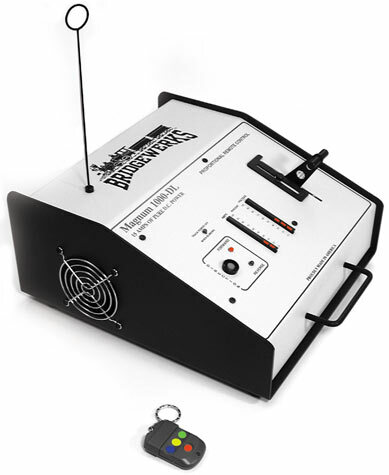 With 15 amps of pure clean DC power, fully operational remote control. 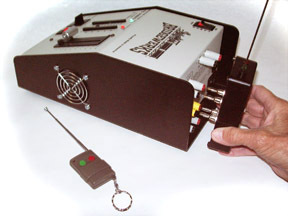 Control your trains’ speed, direction and and stop it with this small hand held control. Same size as the remote key entry on most cars. With 20 amps of pure DC power and individual analogue amp and volt gauges . Add on light is not included, available separately. With 10 amps of pure DC power. LED amp and volt meters. A powerful 5 amp transformer with built in ballbearing fan for cooling. Flawless performer for your larger layouts.